TirujnanacampantarThevaramErithara analkaiyil enti yelliyilNarithiri kaanitai nattamaatuvaarAricilaporupunal ampar maanakarkKuricil cenkannavan koil cervare--- TirujnanacampantarThis is the 54th sacred place in the southern banks of Kaveri, consecrated by Thevaram. Here Lord Brahmapureeswarar appears as a self-manifested deity. 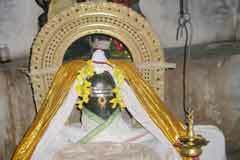 In the sanctum sanctorum, behind the swayambu murthi Brahmapureeswarar, we can have the darshan of Lord Somaskanda. The temple is open from morning 6’o clock to 11.00 am and in the evening from 4.30 to 8.30 pm. 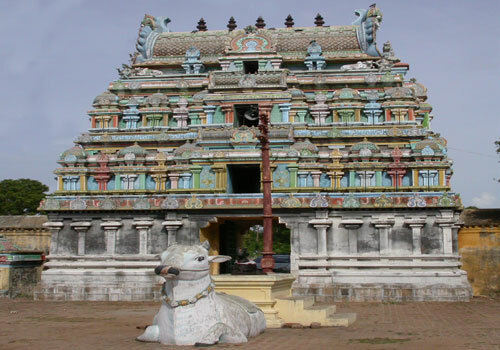 The three inscriptions in this temple belong to the periods of King Raja Raja Cholan and King Kulothungan III. To fulfill their desires, people pray to the Goddess of this temple. When their desires are fulfilled, the devotees perform Sacred Bath to the Deity and adorn Him with new clothes. The place Somaasimaara Naayanar was born. 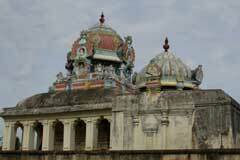 Peruntirukkoil is a small temple built like a little hill with steps that cannot be climbed by an elephant. This is one of the three small temples consecrated by King Kocchenkat Cholan. In the sanctum of patikaasu Vinayakar, there are three small Vinayaka icons in succession. 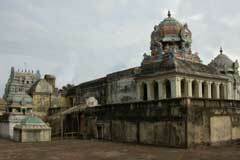 In the paved corridor are the sanctum of Vinayakar, Subrahmaniar, Mahalakshmi and Jambukeswarar. The sanctum of the Goddess who is standing, is separate. Outside to the sanctum, on both the sides are the sanctum of Adippoora Amman and the bed chamber. After going around the sanctum and climbing up the steps and reach the upper storey, we can see Lord Somaskanda’s sanctum and the prime icons of Vinayaka, Kocchenkat Cholan, Saraswathi, Jnanacampantar and Appar. Worshipping the Door-Guards and Lord Vinayaka, we can enter through the small doorway and worship the Prime Deity in the sanctum. On the rear side of the Prime Deity appears Lord Somaskanda. On the right is the courts of Lord Nataraja. There are three Ampalavaana icons in this temple. As koshta icons are Vinayaka, Dakshinamurthi, Mahavishnu and Brahma. The festival icons that can be worshipped are (1) the big icon standing with Nandi who revealed to Brahma (2) Brahma (3) Naalvar. 1. Worshipped by Lord Brahma : When both the Lords Vishnu and Brahma had difference of opinion that they were the Absolute Truth – Brahman – the God stood between them as a lofty fire pillar and told them that any one who could see the head or foot of this fire pillar would be declared as the Cosmic One. Lord Vishnu took the form of a Boar and started his quest to find out the foot, but came back and announced His impossibility. Lord Brahma as a Swan flew off to see the head and returned saying a lie that He had seen the head. God cursed Brahma to become a swan and Brahma pleaded to the Lord to pardon Him. The Lord asked Brahma to go to this sacred place, Punnakavanam and meditate. Brahma reached this holy place, created a pond and with the water of this pond conducted abishekam (sacred bath) to the Lord and carried on His worship. After many years, His curse was absolved. He was freed from His swan form and He commenced His duty of creation. The traditional festival, the Lord’s appearing before Brahma, is celebrated every year on the Maasi Maham day. 2. Annihilation of Ampara and Aampara : Ampara and Aampara were born to Sage Dhurvasa and Madalola, a heavenly maid. Because of the power they got through their askesis, they were worrying the world. The Lord directed Shakti to see Kali, who came as a maid. Both Ampara and Aampara took her to be an ordinary maid and quarreled with each other to have her. The elder fellow died and the younger one was killed by Kali. The place where Kali killed Ampara is Ampakarathur. To be liberated from the sin of killing. 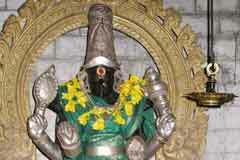 Kali worshipped the Lord at Thirumaakaalam and got His blessings. 3. Extermination of Samkaaraseelan : Samkaaraseelan was a demon. Being afraid of this demon, the devas, according to the direction of Lord Brahma, occupied this holy place. To protect the devas, the Lord sent Kaala Bhairava to kill the demon and thus shielded the devas. 4. 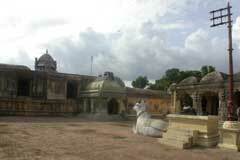 Benediction of Vimalan : Vimalan a Brahmin went on pilgrimage, came to this place and worshipped the Lord for many years. The Lord, for his sake, brought the Ganges of Kasi and granted many boons to him. 5. 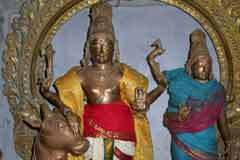 Absolving off Manmatha’s curse : Sage Viswamithra had cursed Manmatha that his arrows should become powerless. 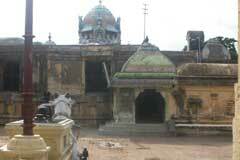 Manmatha got relief from this curse by conducting worship in this sacred place. 6. Nandaraja’s release of Brahmahatthi sin : King Nandkoopan shot with his arrow a sage wearing the tiger’s hide, thinking him to be a tiger,. For this reason, he incurred Brahmahatthi sin and got released from it by worshipping the Lord here. He also consecrated the temple and happily conducted many festivals. 7. Kocchenkat Chola Nayanar : In his previous birth he worshipped Jambukeswarar at Tiruvanaikkaa, as a spider living under the white plum tree. Because of this great fortune, He was born as King Kocchenkat Cholan and built seventy small temples that could not be climbed by elephants. He is one of the sixty three nayanmars. This is the temple built by him. It must be noted that Jambukeswarar sanctum is also here in this temple. Miracle Based: Here Brahmapureeswarar reveals as a self-manifested deity.